This article provides example & specific stair rail construction & installation specifications & building code citation for handrailings used in or at buildings on stairs and at other walking surfaces where handrails are needed. This article series explains and illustrate the requirements for graspable handrails & railings used inside or outside buildings, including guardrails, hand railings on steps and stairs, and stair rails or stair guards for both interior and exterior stairways. used on stairs, balconies, decks, ramps, walks. We include descriptions & definitions of graspability for handrailings, and we illustrate safe and unsafe, graspable and not-graspable handrailings in sketches, photographs, and building code citations. These stair and railing articles provide building code specifications, sketches, photographs, and examples of stair & railing safety defects used in inspecting indoor or outdoor stair railings or handrails and related conditions for safety and proper construction. Our page top photo illustrates an open, exterior stair at La Huerta, Guanajuato, Mexico. This article explains and illustrate the requirements for safe, useable hand railings on steps and stairs, both interior and exterior stairways. Handrailings are a critical safety feature on outdoor and indoor stairs, and ramps, as are guardrails along landings, platforms, decks, porches, and similar structures. At above or left the "handrailing" was filled with running water when we photographed it at el Alhambra in Granada, Spain. This is not a particularly easy rail to grasp if one is falling down the slippery brick stairs. The building code requirement for stair railings typically requires handrailings on stairs that have a total rise of three feet or more. Certainly the stairway that we observed in La Huerta, Mexico (photo at left) as well as the rooftop deck do not meet current safety standards. Handrail continuity: handrails should be continuous - that is a hand can slide along the rail without interruption from above the top riser to above the bottom riser; handrails can be interrupted at a newel post per some local codes but the ICBO says not to interrupt the railing. See details at NEWEL POST CONSTRUCTION. Handrails must provide an adequate handhold for employees to grasp to prevent falls. Handrails and top rails of the stair rail systems must be able to withstand, without failure, least 200 pounds (890 n) of weight applied within 2 inches (5 cm) of the top edge in any downward or outward direction, at any point along the top edge. Handrails must not be more than 37 inches (94 cm) high nor less than 30 inches (76 cm) from the upper surface of the handrail to the surface of the tread. Temporary handrails must have a minimum clearance of 3 inches (8 cm) between the handrail and walls, stair rail systems and other objects. Stairways with four or more risers, or that rise more than 30 inches (76 cm) in height- whichever is less- must have at least one handrail. Winding or spiral stairways must have a handrail to prevent use of areas where the tread width is less than 6 inches (15 cm). We illustrate this feature in the photo just below. Above, installed in a restaurant in San Miguel de Allende, Guanajuato, this stair railing includes a grab rail designed also to block the use of the too-small insider corner of the triangular stair treads just below. In particular the vertical grab bar blocks the unsafe tread area when people are descending the stair. at GRASPABILITY of HANDRAILINGS. Excerpts are below. Some codes (CA/OSHA Title 8 Section 1626) may cause a little confusion between the definition of handrail (green arrow) and guardrail, by adding a third term, stair rail (red arrow). My photo (left) shows the difficulty of making use of a too-low handrailing when descending a stairway. 1926.1052(c)(2) Winding and spiral stairways shall be equipped with a handrail offset sufficiently to prevent walking on those portions of the stairways where the tread width is less than 6 inches (15 cm). 1926.1052(c)(3) The height of stair rails shall be not less than 34 inches nor more than 38 inches from the upper surface of the stair rail to the surface of the tread, in line with the face of the riser at the forward edge of the tread. 1926.1052(c)(4) Mid-rails shall be located at a height midway between the top edge of the stair rail and the stairway steps. (A) Screens, mesh, or other material, when used in lieu of mid-rails, shall extend from the top rail to the stairway step, and along the entire opening between top rail supports. 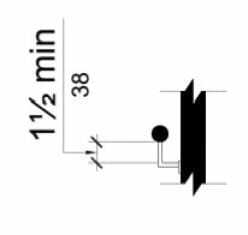 (B) Other structural members, when used, shall be installed such that there are no openings in the stair rail that are more than 18 inches (46 cm) wide. 1926.1052(c)(5) Handrails and the top rails of stair rails shall be capable of withstanding, without failure, a force of at least 200 pounds (890 n) applied within 2 inches (5 cm) of the top edge, in any downward or outward direction, at any point along the top edge. 1926.1052(c)(6) The height of handrails shall be not less than 34 inches nor more than 38 inches from the upper surface of the handrail to the surface of the tread, in line with the face of the riser at the forward edge of the tread. 1926.1052(c)(7) When the top edge of a stair rail also serves as a handrail, the height of the top edge shall be not less than 34 inches nor more than 38 inches from the upper surface of the stair rail to the surface of the tread, in line with the face of the riser at the forward edge of the tread. 1926.1052(c)(8) Stair rails and handrails shall be so surfaced as to prevent injury to employees from punctures or lacerations, and to prevent snagging of clothing. 1926.1052(c)(10) The ends of stair rails, handrails and mid-rails shall be constructed so as not to constitute a projection hazard. 1926.1052(c)(11) Handrails that will not be a permanent part of the structure being built shall have a minimum clearance of 3 inches (8 cm] between the handrail and walls, stairrail systems, and other objects. Type II Residential Handrails - for perimeter larger than 6 1/4"
Some (not all) codes allow handrails that have an overall perimeter greater than 6 1/4", most commonly to permit use of 2x lumber to construct handrails. 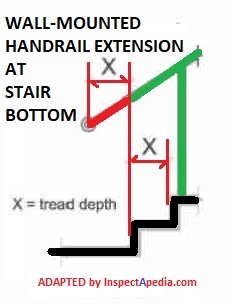 However in these larger sizes, the handrail must have a thumb and finger groove; Some older codes may permit the 2x6 handrail profile at far left in the illustration below, but as of 2009 the handrail needs a groove on both sides. Watch out: No model building code and no other building code that we have surveyed permitted 2x6 or even 2x4 handrailings installed "on the flat" as a safe graspable stair handrail system. 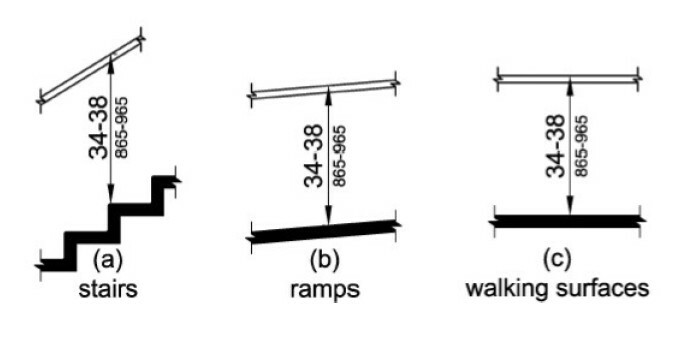 The two sketches here illustrate graspable (and X'd out non-graspable) handrailing profiles. Reader Question: is a 2x6 handrailing safe and legal? Reply: What are the Specifications for a Graspable 2x Hand Railing Along a Stair? That last item in our bulleted list means that code inspectors may approve a 2x6 or 2x4 hand railing placed in the vertical position (narrow dimension facing up - a width that can be readily grasped during a fall, while on flat it cannot - but the design needs to include a finger recess to permit a secure grip. Without that finger or thumb recess (seems to me it should be on both sides of the rail) the grasp is not secure. Our photo (left) indicates mid-stairway activities that could require secure handrails at a Tango dance hall in Buenos Aires. andrails with a circular cross section shall have an outside diameter of at least 1.25 inches (32 mm) and not greater than 2 inches (51 mm) or shall provide equivalent grasp ability. If the handrail is not circular, it shall have a perimeter dimension of at least 4 inches (102 mm) and not greater than 6.25 inches (159 mm) with a maximum cross-section dimension of 2.25 inches (57 mm). Edges shall have a minimum radius of 0.125 inch (3.2 mm). Handrail assemblies and guards shall be able to resist a single concentrated load of 200 pounds (0.89kN), applied in any direction at any point along the top, and have attachment devices and supporting structure to transfer this loading to appropriate structural elements of the building. Intermediate rails (all those except the handrail), balusters and panel fillers shall be designed to withstand a horizontally applied normal load of 50 pounds (0.22 kN) on an area not to exceed one square foot (305mm2) including openings and space between rails. 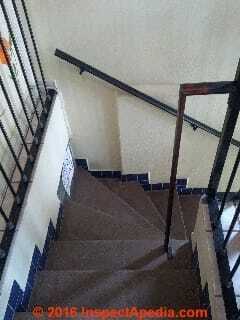 all interior stairs and railings shall be maintained in sound condition and good repair. Commentary: Handrails, treads and risers must be structurally sound, firmly attached to the structure, and properly maintained to perform their intended function safely. During an inspection the code official should inspect all stringers, risers, treads, and handrails. Commentary: This section provides for the safety and maintenance of handrails and guards. See Section PM-702.9 for additional requirements. Every exterior and interior flight of stairs having more than four risers, and every open portion of a stair, landing or balcony which is more than 30 inches (762mm) high, nor more than 42 inches (1067mm) high, measured vertically above the nosing of the tread or above the finished floor of the landing or walking surfaces. Guards shall be not less than 30 inches (762mm) high above the floor of the landing or balcony. Commentary: Handrails are required on all stairs more than four risers in height. Handrails cannot be less than 30 inches nor more than 42 inches above the nosing of the treads (see Figure PM-702.9). Guards are required on the open side of stairs and on landings and balconies which are more than 30 inches above the floor or grade below. The guard must be at least 30 inches above the floor of the landing or balcony. Guards are to contain intermediate rails, balusters or other construction to reduce the chance of an adult or child from falling through the guard. If the guard is missing some intermediate rails or balustrades, it is recommended that the guard be repaired to its original condition if it will provide protection equivalent to the protection it provided when originally constructed. The handgrip portion of handrails shall not be less than 1-1/4 inches (32 mm) nor more than 2 inches (51 mm) in cross-sectional dimension or the shape shall provide an equivalent gripping surface. The handgrip portion of handrails shall have a smooth surface with no sharp corners. Handrails projecting from a wall shall have a space of not less than 1-1/2” (38 mm) between the wall and the handrail. The top of handrails and handrail extensions shall not be placed less than 34” (864 mm) nor more than 38 inches (965 mm) above landings and the nosing of treads. 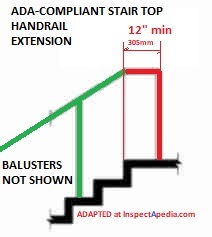 Handrails shall be continuous the full length of the stairs and at least one handrail shall extend in the direction of the stair run not less than 12 inches (305 mm) beyond the top riser [sketch at left] nor less than 12 inches (305mm) beyond the bottom riser. Ends shall be returned or shall have rounded terminations or bends. 2. Handrails my have starting or volute newels within the first tread on stairways in Group R, Division 3 Occupancies and within individual dwelling units of Group R, Division 1 Occupancies. The requirements for stair and ramp handrails in this code are for adults. When children are the principal users in a building or facility (e.g., elementary schools), a second set of handrails at an appropriate height can assist them and aid in preventing accidents. Stairways shall have handrails on each side, and every stairway required to be more than 88 inches (2235 mm) in width shall be provided with not less than one intermediate handrail for each 88 inches (2235 mm) or required width. Intermediate handrails shall be spaced approximately equally across with the entire width of the stairway. 1. Stairways less than 44 inches (1118 mm) in width or stairways serving one individual dwelling unit in Group R, Division 1 or 3 Occupancy or a Group R, Division 3 congregate residence may have one handrail. 2. Private stairways 30 inches (762) or less in height may have a handrail on one side only. 3. Stairways having less than four risers and serving one individual dwelling unit in Group R, Division 1 or 3, or a Group 4, Division 3 congregate residence or Group U Occupancies need not have handrails. he bottoms of handrail gripping surfaces shall not be obstructed for more than 20 percent of their length. Where provided, horizontal projections shall occur 11/ 2 inches (38 mm) minimum below the bottom of the handrail gripping surface. 2. The distance between horizontal projections and the bottom of the gripping surface shall be permitted to be reduced by 1/ 8 inch (3.2 mm) for each 1/ 2 inch (13 mm) of additional handrail perimeter dimension that exceeds 4 inches (100 mm). Advisory 505.6 Gripping Surface. People with disabilities, older people, and others benefit from continuous gripping surfaces that permit users to reach the fingers outward or downward to grasp the handrail , particularly as the user senses a loss of equilibrium or begins to fall. 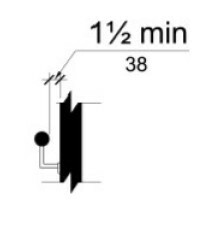 You can see in this example, also from Florida's handrail code, that there is also a recommended minimum clearance distance between the under-side of the handrailing and a supporting horizontal projection that carries the railing. The intent of a handrail is to provide a handgrip for people using a stairway. Stairways which serve an individual dwelling unit must have a handrail on one side if they have four risers or more. Such stairways with fewer than four risers are not required to have handrails. Handrails projecting from a wall shall have not less than 1 1/2 inches between the wall and handrail. Handrails must be placed between thirty-four and thirty-eight inches above the nosing of the stair treads. Ends [of the stair handrailings] must be returned or have rounded terminations or bends. The handgrip portion of handrails shall not be less than 1 1/4 inches nor more than 2 inches in cross-sectional dimension or the shape shall provide an equivalent gripping surface. Note: this code establishes minimum occupational safety & health standards that apply to all places of employment in California. This is not a residential building code requirement, but this text in our OPINION models stair construction safety & design specifications. Also see STAIR TREAD DIMENSIONS and the other stair measurement parameter subtopics outlined in our detailed article links listed at the ARTICLE INDEX the bottom of this article . (a) Stairways shall have handrails or stair railings on each side, and every stairway required to be more than 88 inches in width shall be provided with not less than one intermediate stair railing for each 88 inches of required width. Intermediate stair railings shall be spaced approximately equal within the entire width of the stairway. Note: Intermediate stair railings may be of single rail construction. (1) Stairways less than 44 inches in width may have one handrail or stair railing except that such stairways open on one or both sides shall have stair railings provided on the open side or sides. (2) Stairways having less than four risers need not have handrails or stair railings. (3) Stairways giving access to portable work stands less than 30 inches high. (4) Stairs that follow the contour of tanks or other cylindrical or spherical structures where the construction requires the inside clearance between the inside stair stringer and wall or tank side to be 8 inches or less, shall not be considered an "open side." (5) Guardrails may be erected provided a handrail is attached. (b) A stair railing shall be of construction similar to a guardrail (see Section 3209) but the vertical height shall be in compliance with Section 3214(c). Stair railings on open sides that are 30 inches or more above the surface below shall be equipped with midrails approximately one half way between the steps and the top rail. Note: Local building standards may require 4-inch spacing of intermediate vertical members. Ends shall be returned or shall terminate in newel posts or safety terminals, or otherwise arranged so as not to constitute a projection hazard. (d) A handrail shall consist of a lengthwise member mounted directly on a wall or partition by means of brackets attached to the lower side of the handrail so as to offer no obstruction to a smooth surface along the top and both sides of the handrail. The handrail shall be designed to provide a grasping surface to avoid the person using it from falling. The spacing of brackets shall not exceed 8 feet. (e) Handrails projecting from a wall shall have a space of not less than 1 1/2 inches between the wall and the handrail. (f) The mounting of handrails shall be such that the completed structure is capable of withstanding a load of at least 200 pounds applied in any direction at any point on the rail. Note: Authority cited: Section 142.3, Labor Code. Reference: Section 142.3, Labor Code; and Section 18943(b), Health and Safety Code. 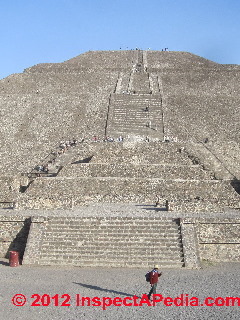 Our photo illustrates very challenging stairs with a high rise, climbing to over 230 feet at the Pyramid of the Sun in Teotihuacán outside of Mexico City. Adding to the challenge is the combination of uneven and very tall rise steps, the starting altitude (7350 feet) that can add to dizziness for tourists, a flexible cable "handrailing", and the sun itself. Construction began abut 2 A.D., a bit before OSHA was established. Stairways with four or more risers or rising more than 30 inches (76 cm) in height- whichever is less- must be installed along each unprotected side or edge. When the top edge of a stair rail system also serves as a handrail, the height of the top edge must be no more than 37 inches (94 cm) nor less than 36 inches (91.5 cm) from the upper surface of the stair rail to the surface of the tread. Stair rails installed after March 15,1991, must be not less than 36 inches (91.5 cm) in height. Top edges of stair rail systems used as handrails must not be more than 37 inches (94 cm) high nor less than 36 inches (91.5 cm) from the upper surface of the stair rail system to the surface of the tread. (If installed before March 15, 1991, not less than 30 inches [76 cm]). Stair rail systems and handrails must be surfaced to prevent injuries such as punctures or lacerations and to keep clothing from snagging. Ends of stair rail systems and handrails must be built to prevent dangerous projections, such as rails protruding beyond the end posts of the system. Unprotected sides and edges of stairway landings must have standard 42-inch (1.1 m) guardrail systems. Intermediate vertical members, such as balusters used as guardrails, must not be more than 19 inches (48 cm) apart. Other intermediate structural members, when used, must be installed so that no openings are more than 19 inches (48 cm) wide. Handrailing Extension Requirements on stairs, landings, ramps. Handrailings in public areas are generally required to extend 12-inches past the top or bottom step, as shown in this sketch from Florida's Handrailing Code. The same requirement pertains to access ramps. Codes generally do not require extensions on private handrailings. In our two photographs shown here you will see handrailing or guardrailing extensions on a stairway and on a ramp that are on the Vassar College campus in Poughkeepsie, NY. The Florida Handrail Code at Figure 505.10.2 the illustrations at left explain the 12-inch extension requirement for public handrails at the top or bottom of certain stairs or ramps. Our photo (above left) illustrates well-designed stair guardrail /handrail extensions at the top and bottom of these exterior stairs located in Poughkeepsie, NY. 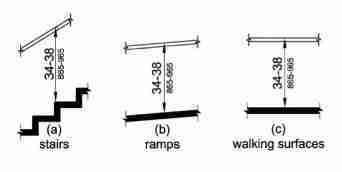 Handrail extension requirements for ramps are also illustrated at RAMPS, ACCESS. Continue reading at HANDRAIL GRASPABILITY CODES or select a topic from closely-related articles below, or see our complete INDEX to RELATED ARTICLES below. Or see GUARDRAILS on BALCONIES, DECKS, LANDINGS details about railings on landings and open hallways or other horizontal walking surfaces. HANDRAIL CODES & OSHA HAND RAIL SPECS at InspectApedia.com - online encyclopedia of building & environmental inspection, testing, diagnosis, repair, & problem prevention advice.